Unemployment figures have dropped to 5.3pc showing all jobs lost during the recession have been regained. 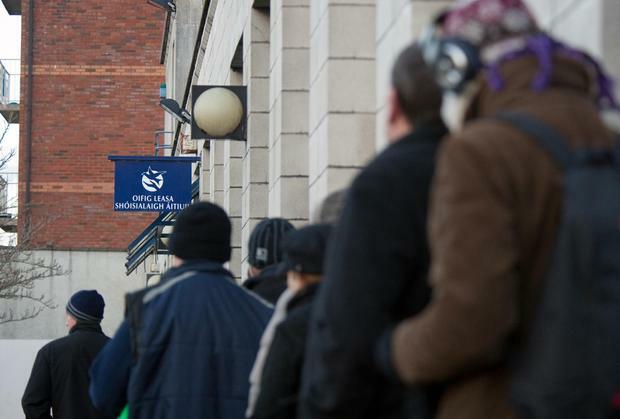 The Central Statistics Office jobless figures provided via the latest Labour Force Survey, are the lowest in a decade. Total employment rose to 2.237 million in the first quarter of 2018, slighly above the Celtic Tiger high recorded in the final quarter of 2007. However, the CSO has stated that Ireland now has a larger population than in 2007 due to workers who’ve moved to the country. The figures show the economy has witnessed 23 consecutive quarters of jobs growth since 2012. The newly released figures revised statistics for unemployment from May – which went down to 5.3pc, from 5.8pc, the lowest level recorded since 2008. Full employment equals a jobless rate of around 5pc, according to Economic and Social Research Institute (ESRI), which this week said signs of overheating were starting to emerge in the Irish economy. Employment rose in 11 of the 14 sectors during the year with public administration which was up 11.8pc and construction 9.9pc seeing the largest annual increases. Employers’ group Ibec said the latest figures were additional evidence of the strong momentum in the economy but this in itself threw up further challenges. “With the economy approaching full employment the biggest challenge facing the Irish labour market will be finding workers to fill vacancies,” Ibec economist Alison Wrynn said.